For 32″ to 52″ flat panel displays. 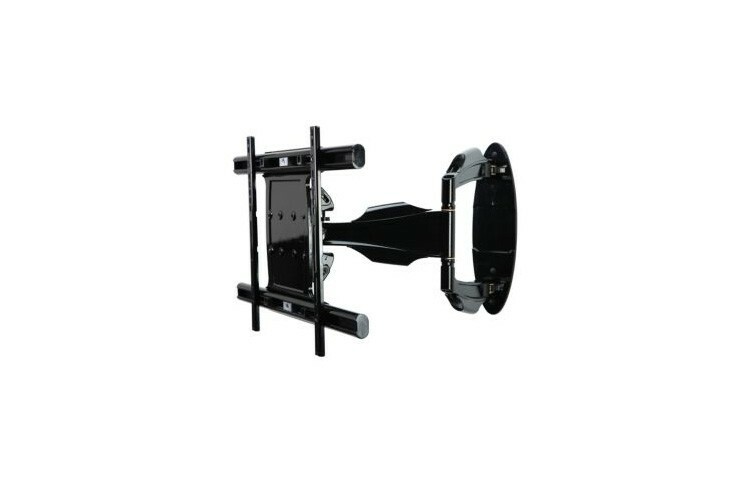 From any angle, this Universal Articulating Wall Mount reflects remarkable form and function. Extending the flat panel display up to 27.43″ (697mm) from the wall and allowing for a full 180° of side-to-side motion for perfect view positioning of displays up to 52″. Fine-tuning of the installation is simple with its side-to-side display leveling and 1″ (25.4mm) of vertical adjustment features that help achieve perfection. This articulating wall mount also provides display centering on the wall plate and integrates a desirable cable management system, centering the flat panel display on the wall when retracted and organizing and protecting the cables. Designed and built-in the USA, this mount maintains the same brilliant look as the entire SmartMount® 700 Series line of articulating wall mounts and pivot wall mounts. Universal model SA752PU provides compatibility for 32″ to 52″ flat panel displays with mounting patterns up to 689 x 439mm (27.12″ x 17.29″). Display can be held as close to the wall as 4.43″ (112mm) or be extended as far as 27.43″ (697mm). Integrated cable management contains, protects and conceals cables for a clean clutter-free look. One-touch tilt allows for +15°/-5° without the use of tools for easy viewing angle adjustment. Multi-link construction allows for a full 180° range of motion. Display can be pivoted a full 90°. ±5° of roll allows for post installation leveling. Display can be rotated from portrait to landscape without removing the display for easy orientation changes. 1″ (25.4mm) vertical adjustment for display position fine tuning.